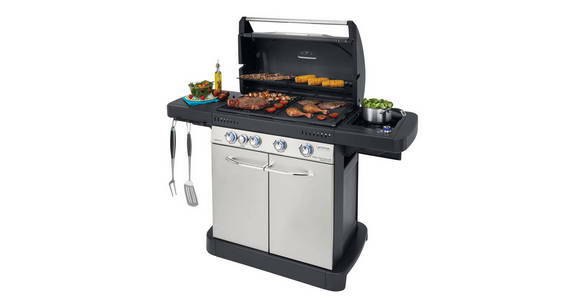 This stylish BBQ delivers high ultimate grilling and perfect cooking results with ease. The Master 4 Series Classic SBS gas barbecue combines unique features including the innovative Even Temp technology for consistent heat across the entire cooking surface, the versatile Culinary Modular system which allows you to prepare dishes from paellas to pizzas, the reliable InstaStart electronic ignition, for dependable lighting every time and illuminated control knobs. Thanks to the 4 high-power stainless steel burners, combined with the new double-wall stainless steel lid, you will have the freedom to grill all year round, confident that you have the ultimate barbecue performance at your fingertips. The Master 4 Series Classic SBS also comes with the impressive Searing Boost Station (SBS), an extra hit of intense heat, giving those authentic steakhouse stripes and flavour. Use the side burner to prepare accompaniments to your grilled food, cooking up a full feast with ease. The enameled cast iron split grid and griddle brings extra cooking convenience and ensures great results, it is the best material to cook on, the cast-iron conducts heat more intensively and consistently than other materials, while the enameled coating makes for easy cleaning. The improved InstaClean® system with its new treatment protects the removable barbecue surfaces for effortless, dishwasher-safe cleaning after use.